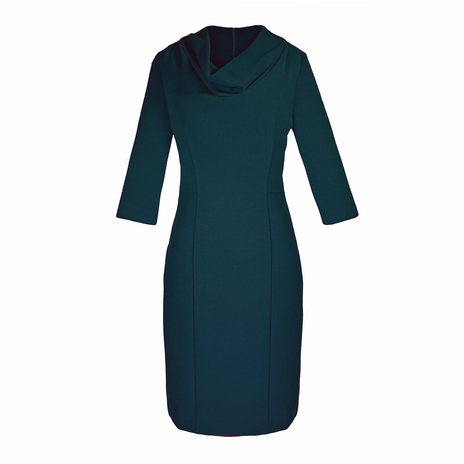 Click here to see this dress worn by TV presenter Laura Tobin (5'4). A figure-skimming petite dress with a flattering cowl neckline and ¾ length sleeves. Panelled throughout to elongate your petite frame and enhance curves, this elegant dress looks fabulous on petite women of all sizes. Perfect for client meetings, networking or that important presentation. COMMENTS : Fits like a glove, gorgeous dress.! Fabric is lightweight so better suited to Summer. Have machine washed it at 40 degrees three times and it comes out looking new. No creasing or pilling. Continue the ladylike mood and team with pointed toe heels, subtle gold jewellery and a simple box clutch.